Exit at Ashford-Dunwoody Road (Exit 29). Turn right off ramp; continue straight for 0.5 mile. Turn left at the 4th traffic light onto Perimeter Center West. There is a McDonalds on the corner. 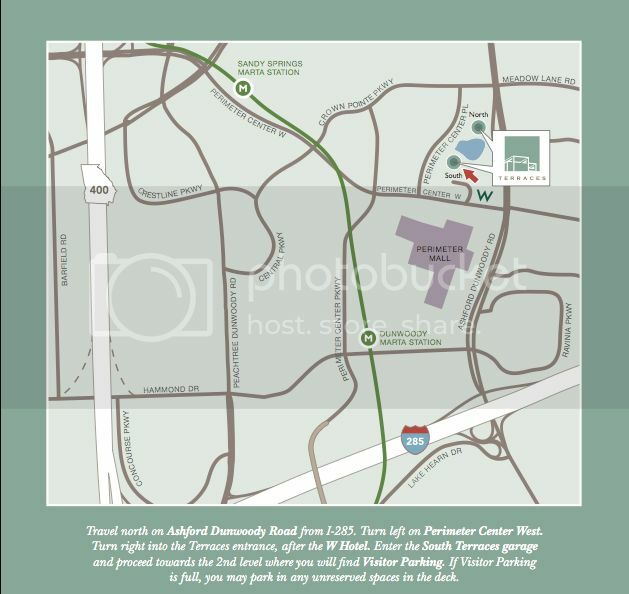 Turn right at the next light, Perimeter Center Place. You must push the button and take a ticket. Bring the Parking Ticket with you and give to the front desk person. Level 2 is Visitor Parking. There is a covered walkway by the elevators. You must exit on LEVEL 3 with the VALIDATED PARKING TICKET. Exit at Ashford-Dunwoody Road (Exit 29) and remain in the left lane as the ramp forks. Turn left at the end of the ramp; continue straight for 0.5 mile. Exit at Dunwoody/Sandy Springs (Exit 5). Cross over Mount Vernon and continue on Abernathy. You will pass REI, TJMaxx, PetSmart, Total Wine and The Container Store. Turn LEFT at the Container Store. This is Perimeter Center Place. Turn right into the first driveway. This will put you in the Parking Garage on Level 3. Push the button and take a ticket. Bring the Parking Ticket with you and give to the front desk. Exit at Dunwoody/Sandy Springs (Exit 5A), and move into the right lane. If you have parked on Level 2 Visitor Parking, there will be eight (8) Keller Williams Realty visitor parking spaces just past the elevators near the covered walkway. Should they be full, you may park in any 2 hour visitor space or unmarked space. Follow the directional signs into the Terraces building. Our office is just past the concierge desk. We are Suite 100. PLEASE NOTE: While you are free to park in any unmarked space in the garage – you should refrain from parking in spaces marked "reserved" or exceeding the 2 hour limit on “visitor" spaces. The building management company may ticket and boot your vehicle. Also, be sure to bring in your Parking Ticket for validation. Our receptionist can validate it for you, or the security desk (if you are coming in outside of business hours). Also, when you leave, you will need to exit the Parking Deck on Level 3 ONLY.